Kenton Brothers recommends, sells, installs and services Garrett Metal Detectors, the global leader of walk-through and hand-held commercial metal detection products. 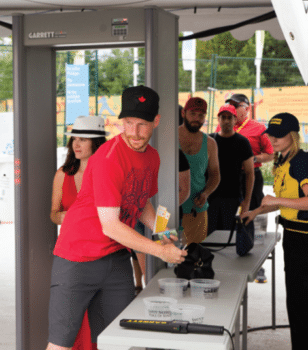 From the Olympic Games to school security systems across the nation, Garrett Metal Detectors are recognized as the preeminent technology in metal detection systems. For more than 50 years, Garrett has engineered the most advanced metal detection products. Keeping your location safe is the first priority. But minimizing impact to customers, students, or event attendees is a significant consideration that brings Garrett products to the forefront of a Kenton Brothers installation. 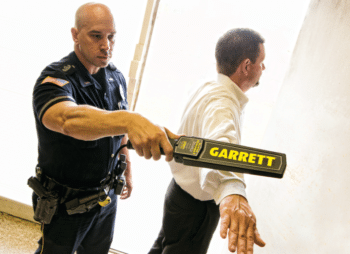 Kenton Brothers is your source for all Garrett Metal Detectors, but two of the most popular and widely adaptable versions are the PD 6500i walk-thru system and Super Scanner V wand. The PD6500i brings superior versatility with selectable settings for loss prevention and threat detection in municipal buildings like courthouses, as well as for security in schools and at special events. The Super Scanner V brings hand-held convenience to your screening process while relying on the ultimate sensitivity to detect even foil-wrapped drugs and tiny jewelry from just 1”. Is a hand-held or walk-through metal detector the right solution for your organization? Connect with Kenton Brothers to protect your people, property, and possessions.